Few parents get the chance to see their child go on to set records.That hasn't been the case with Stan Holloway though. He has had the blessing to see both of his sons - Trey and Grant - set record after record at all levels of competition. Trey blazed the way and now Grant is taking it to the next level. Both athletes ran for Grasssfield High in Chesapeake but got their start as a part of Track 757, a club team coached by Stan Holloway. During his 15 year tenure with the club he has coached his kids and numerous other All-American athletes. That included nine national champions just this weekend at the AAU Championships. Coach Holloway is also the hurdle coach at Oscar Smith high school and over just a few years he has built a hurdle contingent that could battle with anyone in country. The stars of his team being Kurt Powdar and Aaron Shirley, a duo that has run together for over eight years now. This past weekend at New Balance Indoor Nationals his cover was blown about how good his squad was though. 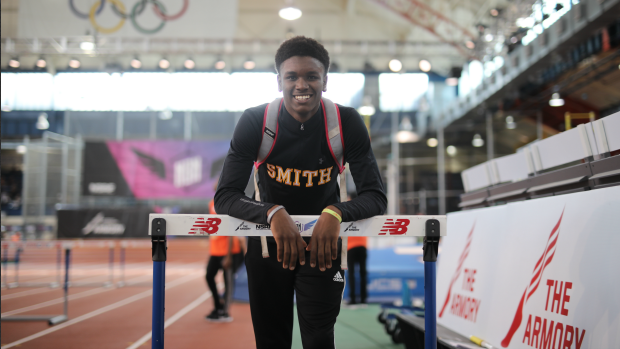 His lineup of all underclassmen were able to win the shuttle hurdle relay national title and his individuals were able to run some fast times too. As a father though the toughest decision for him was where to be last weekend. He had his athletes to coach in New York and his youngest son, Grant Holloway, competing at the NCAA National Championships in Texas. The biggest performance though of the weekend wasn't Grant or the victorious shuttle hurdle relay team but really was Oscar Smith junior Kurt Powdar. Powdar may have false started in the finals as the favorite but still ran 7.08 (55) and 7.65 (60) in the semifinals. That time ranks him second in state history and just .03 and .06 off of Grant Holloway's junior national class records. That is right, Grant Holloway's records may get broken by an athlete coached by his dad. "Kurt and I truly are not going after Grant's record. We want to be the best hurdler every time we step on the track. If at the end of the day, Kurt breaks Grant's record, then you tip your hat to him and get back to work. Kurt and Aaron have always been good hurdlers. People just didn't understand how good they both were because Grant's light was so bright, they were overshadowed"
Though Coach Holloway isn't going to say they are going after the record, you have to think it is in their minds now. Especially considering how much Kurt improved this season and round over round at nationals. He would likely have broken those records in the final. Both Kurt and Aaron will move to outdoors hungrier than ever. Aaron will certainly shine in the 300H as he chases that state record while Kurt makes move in the 110H. They will also have a very strong 4x110H team come outdoor nationals. There is one thing though that Grant, Trey, Kurt, Aaron and a lot of other hurdlers have in common..."some of the fastest hurdlers in the state of Virginia have one thing in common. They were part of Track 757."